I was hoping to get some quick thoughts on a patient who is presenting to our office tomorrow for a DOT PE, who has been on Subutex (Suboxone) for 4 years. She does not have a CDL license, however requires an "endorsement" to operate a Van transporting people. She has a letter from her treating physician, who is a board certified psychiatrist, stating she has been stable on the medication for 4 years, and in his opinion has no contraindication to operating a motor vehicle. My gut instinct is to decline this patient. Any thoughts or opinions otherwise? It's a narcotic (opioid) and 21 CFR 1308.11 (391.42(b)(12)) says "nope". Any addictive potential medication disqualifies. Methadone also excludes. I formerly did DOT exams but not since changes (no longer in that setting) but online info at FMCSA website is my source for this response. It's a narcotic (opioid) and 21 CFR 1308.11 (391.42(b)(12)) says "nope". Any addictive potential medication disqualifies. Methadone also excludes. I formerly did DOT exams but not since changes (no longer in that setting) but online info at FMCSA website is my source. It does say that there is an exception to the rule, and that is if they have documentation from treating physician stating medication, dose, why they are taking, and that it does not interfere with their ability to drive. That being said it does make it very clear that just because someone gets this letter, does not mean we have to qualify them. FMCSA recommends that CMV drivers who take these prescribed medications should not be found medically qualified to operate a commercial motor vehicle. Bottom line, do you want YOUR name on the certificate as long as you have justification for your decision (which I would copy/print and put with record)? My thinking goes like this: this driver is either on the road with pain that requires Suboxone to control, or they are on the road with pain that is not controlled with Suboxone. Neither will fly when it's me signing the card. It's an easy "no." How is it that sometimes we find our purpose in tragedy. I lost my grandma to diabetes. Diabetes did not take mercy on her. It took her slowly, until there was nothing else to take. It started with her kidneys, they slowly stopped functioning, so she had to be placed on dialysis. Lucky for her, my aunts cared enough to be trained on the process, and she was able to have it done in her home, that's if you consider that lucky. The next thing diabetes took was her sight. It continued taking from her until there was nothing more to take. As if losing your sight was not enough, it took the sensation off of her feet, then it decided to take her toes and eventually her feet. What happens to a person that needs to be dialyzed every other day, can no longer see or walk? They slowly lose their will to live, until one day, that will is completely gone. It is an extremely difficult thing to watch someone you love, suffer on a daily basis. At the end of their journey, you find comfort in knowing that they are no longer suffering, but you also wonder, is there anything I could have done to prevent this? To my previous question, the PA profession was my answer. I believe that most medical problems can be prevented with the right care and knowledge, and if they cannot be prevented, they can be stopped from progressing. I want to become a PA because I want to keep people and their families from experiencing the pain my family and I went through with my grandma. I know it is not possible to save everyone, but I want the opportunity to at least try. I have always known I wanted to be a part of the medical field. Every time someone asks me, why do you want to be a physician assistant, my response is always because I cannot imagine being anything else. I placed myself in a job that would allow me to experience the duties of a physician assistant. I have seeing the ins and outs. I have been a part of it, not as a PA, but as scribe that works very closely with them in the clinic or in the emergency department. Every day, I am amazed by their skills and knowledge. I learn something new, a new approach, a new technique, a new diagnosis, a new treatment with every shift, and I just want to keep on learning. I have learned how to differentiate a Bell's Palsy from a TIA or a stroke. I have learned the importance of the NIH stroke scale and the importance of properly assessing the score. I can tell you that a sudden sharp pain to your back and a positive CVA most likely means a kidney stone or pyelonephritis due to a urinary tract infection. A pain to your RLQ with a high white blood cell count and a positive McBurney's point could definitely be a sign for acute appendicitis or how an elevated amylase/lipase level accompanied by nausea and vomiting probably means pancreatitis, especially if that pain occurs after eating greasy/spicy foods. I have loved every single minute of working as a scribe. I cannot wait to start this career and apply everything I have and will learn. Physician assistants are not afraid or intimidated by how complicated a patient might be because of how prepared they are. They have this confidence because if they have a question about how to proceed with a patient, they have the benefit of consulting with the attending physician. There are limitations to how much we know, which is why this is one of the great benefits of the physician assistant career. My main goal as a provider would be to offer the best care to a patient, and knowing that I have the opportunity to ask for help or guidance from the supervising attending would allow me to do that. I also like the flexibility of the PA career. As a PA, you have the opportunity to work in different specialties, for me that is essential because I have multiple interests. I love working in the clinic setting as well as the ER, and by becoming a PA, I would have the opportunity to work in both. As a child I had moments when I would stare off into space as if my brain was not connected to the rest of my body. My parents were worried so they took me to a pediatric neurologist. The diagnosis was Juvenile Absence Epilepsy and it began a journey of blood tests, EEGs, MRIs and checkups for the next six years of my life. For a child, it was a bit unnerving, but when I began to see the same person at every visit I became more comfortable. I called the woman “Dr. Theresa” and she became the calming presence, someone who monitored my medication and assured me everything was fine. When I learned “Dr. Theresa” was actually a Physician Assistant, I was surprised. She did everything I imagined a doctor would do, she explained my treatment plan, wrote prescriptions, and always took the time to ask about my life and concerns. I was intrigued by this woman who had many similar responsibilities of a doctor. What would have normally been a traumatic childhood experience actually became a blessing. This unique opportunity allowed me to be exposed to a PA at a young age and prompted my decision to become a healthcare provider. I began to volunteer in my community and take every opportunity to learn about this career path. I wanted to be around people who helped others. I volunteered at food drives for homeless veterans, collected clothes for orphanages and foster children and fundraised for the families who lost their homes in the 2003 Cedar Fire in Alpine, CA. I also had the opportunity to work with young children through the 4-H Equine Group within the Helen Woodward Animal Shelter. Most of the children I worked with were Autistic, which allowed me to learn effective ways to communicate in nonconventional ways. For example, one boy used only lyrics from songs by The Beatles to commutate to me, so I had to brush up on Beatles! The sad songs meant he was in pain or a bad mood and the more upbeat songs meant he was feeling excited and happy. This experience became the catalyst for focusing my efforts to become a PA. In college, my most rewarding volunteer experience was working at The Challenge Center, a physical therapy rehabilitation center for patients who suffered from brain and spinal cord injuries, congenital defects or chronic debilitating diseases. Having obtained my Assisted Fitness Trainer certification, I was able to work with patients one-on-one. It was a true test for me to see whether or not I could handle a full patient load while attending school full time. I tracked the progress and charted the stats for each of my patients. I felt like a true healthcare provider during my time at The Challenge Center because I was able to change or “prescribe” the patient’s workout regimen. The workouts made a difference, not only on the patient’s physical abilities, but also on their attitudes and outlook on life. While working in the physical therapy field taught me a great deal about patient care, I felt more passionate about the role a PA plays in healthcare. Wanting to learn more about the profession, I shadowed a Physician Assistant named Alison. I observed her patients’ conditions and how she determined the course of treatment for each situation. She displayed the patience, kindness and professionalism that it takes to be a successful PA. I remember an instance with an elderly woman who was nervous about her biopsy results. Alison explained the outcome to her in a manner that put her at ease. Alison’s dedication to her patients reminded me of the care I received as a child with JAE and reinforced my decision to become a PA.
On the academic front, my early academic transcripts show a lack of focus. Freshman year of college was a difficult transition for me. I was exposed to the dual pressures of prioritizing my schoolwork and enjoying the freedom of living on my own. I was not mature enough to know that my early decisions would negatively affect my future chances of getting into PA school. I began taking courses to work toward my undergraduate degree in kinesiology, but knew PA school was the ultimate goal. My grades steadily improved and I ended up with nearly straight A’s during my final two years, even repeating some courses to make my application more competitive. I believe my freshman year struggles allowed me to become more mature, more focused and more determined to achieve my goal of becoming a PA.
My dream is now within reach. There will be an extreme need for primary care providers as a result of the restructuring of health care in this country and Physician Assistants will be at the forefront of the movement toward more affordable, accessible, and reliable healthcare. PAs will be the gatekeepers of the health care industry and will positively affect countless lives. I look forward to helping contribute to improving the health of patients in need. "Excuse me, excuse me!" I cried out frantically, as I had just received news that my grandmother had been moved to a nursing facility due to her Alzheimer's condition worsening. I rushed over to the front nurse's station to ask which room she was in and was escorted to her room. Bright fluorescent lights lit up the hallway as I nervously gathered my thoughts on how I could greet my grandmother, the one who had raised me from childhood and became a second mother to me as well. I had brought over her favorite purple orchids in order to brighten her mood and with hope that maybe she could recognize the familiarity of the connection to me. To my relief, my grandmother recognized me instantly, and continued to recognize me till her last day in nursing care. Placing my grandmother in a nursing care facility was the most heartbreaking decision my family had to make, but we put in the effort to visit her every day. About eight months into her stay at the nursing home, she caught pneumonia which deteriorated her health in a blink of an eye. The nightmare didn’t just end here; the weakening of her body opened the door to other various health problems as well, which led to frequent visitations to the hospital. This is where I met my first physician assistant and grew profound respect for them. While my grandmother’s physician came in and out of her room for quick visitations, it was her PA that seemed to help close the gap of disparities in the healthcare system by providing a more personalized care to the patients. I was also able to recognize the clear and solid support that the PA provided in the context of the physician-PA framework. Her PA also first tended to my grandmother’s stomach abnormality and diagnosed the root cause of her abdominal distention and provided the appropriate treatment for it. I was very intrigued to see a mid-level provider take part in such crucial role between the supervising physician and the nurses, working as a collaborative team to ensure the highest patient care possible. Having worked as a buyer in a procurement department for three and a half years, I thoroughly loved the “team-based” approach with the head buyers and my vendors and customers. However, I had left the career as I’ve always felt that the satisfaction from thriving upon sales and profit wasn’t fully there for me. Witnessing my grandmother’s PA work with such compassion and professionalism towards the well-being of a human being inspired my initial interest in the profession. With this new ray of motivation, I recently became a clinical care extender volunteer at St. Joseph Hospital of Orange through COPE’S Health Solution, a program that is designed to give access to direct patient care to pre-health professionals, to see where I stood in terms of interacting and caring for the ill. My duties consisted of providing basic patient care such as feeding, bathing, taking their vital signs, and most importantly, providing unconditional love at their most vulnerable times. However, despite the satisfaction that I received from knowing that even a single minute of my time given to patients can have a significant positive impact in their lives, I also felt a sense of frustration due to the limitations of what I could provide for them as a volunteer. My determination to take my education and skills to the next step where I can provide more than just bedside care increased. I observed the nurses and their assistants and admired them for their recognizable diligence and compassion, but their roles still didn’t satisfy the goals that I was looking. On the contrary, I found it a blessing that I was able to encounter a handful of PAs on the floor who were able to answer many lingering questions for me that I had regarding their profession. I realized that being a PA is what would fulfill my dream in achieving the type of patient care that I wish to provide. Through the intensive and advanced PA training, I will provide medical care without having to be a physician, and still get to partake in a variety of tasks from diagnosing to giving physical exams to more specialized care such as assisting with surgeries. This is very appealing to me because I love doing a variety of different types of tasks that specialize in flexibility. Next year, I look forward to starting my education as a PA student. Overall, my interests and experiences have prepared me well to pursue a career as a PA. My strong academic background in science and extensive knowledge of the human body will help me excel in my PA school courses. Additionally, my sensitivity towards patients and interest in their well-being will allow me to become a compassionate PA. Volunteering at St. Joseph on various floors has also allowed me to learn the difference between each health provider and has also confirmed my belief that PA would be the best fitting for my personality and personal goals. I discovered my desire to counsel patients in maintaining proper health for preventive care as well, rather than just on post-care treatment. As a future PA, I am excited to work as part of a team that ensures every patient receives the care he or she needs in the most efficient and comfortable manner. I look forward to spending the new few years of my life learning from and growing with peers that have similar aspirations. "Excuse me! Excuse me!" I cried out, frantically, as I had just received news that my grandma had been moved to a nursing facility due to her Alzheimer's condition worsening. I rushed over to the front nurse's station to ask which room she was in and was escorted to her room. Bright fluorescent lights lit up the hallway, as I nervously gathered my thoughts on how I could greet my grandma, the one who had raised me from childhood and became a second mother to me as well. Would she recognize me today? Hopefully, these flowers aren't too much, I murmured to myself. I had brought over her favorite purple orchids, in order to brighten her mood and maybe she could recognize the familiarity of the connection to me. To my relief, my grandma recognized me instantly, and continued to recognize me till her last day at the nursing care. At the end of year 2014, my grandmother spent the last few months of her life fighting a debilitating case of pneumonia which also opened the door to other various health problems. Throughout her treatment, both her physician and the physician’s assistant took turns overseeing her treatment. This was my first actual encounter with a PA, and during this time I learned a great deal about what PA’s do to support their patients, particularly relating to the lung and kidney infections for my grandma. I found it extremely intriguing to see a mid-level provider take part in the important role amongst his/her supervising physician and the nurses, working as a collaborative team to ensure the highest patient care possible. Having worked as a buyer previously for 3.5 years, I thoroughly loved the “team-based” approach with the head buyers and my vendors and clients. However, I had left the career as I’ve always felt that the satisfaction from thriving upon sales and profit with wasn’t fully there for me. Witnessing my grandmother’s PA’s soothing compassion, professionalism, and accuracy with her treatment led me to develop interest for the profession. Inspired by the experience my grandmother had with her PA, I took a few basic science courses to test my interest in science and excelled in all of them. Taking Anatomy, Physiology, and Microbiology class further helped me discover my passion for the human body and the phenomenal importance of understanding it to lead healthy lives. It urged me to learn more about the medicine and the root causes of diseases and illnesses where I can actually help patient by treating and diagnosing them. I discovered my desire to counsel patients in maintaining proper health for preventive care, rather than just on “treatment.” To utilize this knowledge in a medical setting, I volunteered at the COPE’S Clinical Care Extender program in St. Joseph, a program that is designed to give access to direct patient care for pre-health professionals, to see where I stood in terms of interacting and caring for the ill. My duties consisted of providing basic patient care such as feeding, bathing, and taking their vital signs, but most importantly, showing the patients that everyone in the healthcare field is an extended family member to them that provide not only care for their illness, but also unconditional love at their most vulnerable times. However, despite the satisfaction that I received from knowing that even a single minute of my time given to patients can have a significant positive impact in their lives, I also felt a sense of frustration due to the limitations of what I can provide for them. I wanted to offer more than just bedside care. I observed the nurses and their assistants and admired them for their recognizable diligence and compassion, but their roles still didn’t satisfy the answers that I was looking for. I was curious as to why certain human beings were more prone to certain diseases and how each different individual’s body responded differently to certain treatments. Even though I felt that there was some sort of lackluster with my scope of volunteering at St. Joseph, I also found a blessing for me as I was able to encounter a handful of physician assistants on the floor who were able to answer many lingering questions for me that I had regarding their profession. 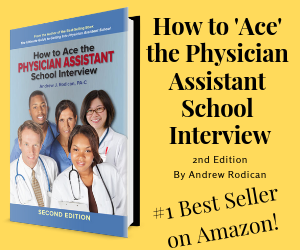 I was able to realize that being a physician assistant is what would fulfill my dream in achieving the type of patient care that I wish to provide. I would have more power and control to assisting patients rather than just doing bedside care as a nurse. This shines a part of my personality because I love doing a variety of different types of tasks that specializes in flexibility. I could utilize my attention to giving medicinal help without having to be a doctor, and instead partake in diagnosing and giving the best therapeutic care from small needs like physical exams to bigger care like assisting with surgeries. This type of freedom in the healthcare world makes me love the idea of becoming a PA. As a PA, I will work as part of a team that ensures every patient receives the care he or she needs. I am excited to be a PA that makes a difference in the lives of others, and I look forward to spending the new few years of my life learning from and growing with peers that have similar aspirations. Thank you in advance, to anybody that looks this over. I greatly appreciate it! As a child, I would frequently go sailing with my father. We would cast the lines, pull in the fenders and guide the boat out of the bay. Working together we would adjust the sails to allow the wind to guide us. I grasped the knowledge that the breeze moved the boat, but did not understand the full mechanisms as to how. As our sailing trips increased, I gained more skills, and my knowledge vastly improved. One day I woke to realize those peaceful moments had passed; the sails lost the wind and slowly begin to slack. I was forced back to reality. “I am initiating a massive transfusion in the Emergency Department on a female, Jane Doe, age unknown”, the ED physician tells me over the phone. My shift in the Blood Bank just started. I glance at the clock noting the time. We, as a team, have less than ten minutes to complete the first round of blood products needed for the patient. I reach for the “massive transfusion” paperwork to begin filling out, while simultaneously designating the technicians to fulfill duties I assign; thaw plasma and cryoprecipitate, get a cooler together for blood products. I quickly get to work setting up six uncrossmatched red cell products. The patient’s age is unknown indicating the need for O-negative red cells. Eight minutes later the Emergency Department technician is at the Blood Bank window waiting for any products ready. I issue the products, place the necessary units in the cooler and pass them off to the technician. The technician scurries away. I have completed my part, or piece of the puzzle, with the patients’ medical care, providing timely and efficient service. I, however, want the responsibility of a bigger piece of the puzzle: direct involvement with patients. Continuing my education in a Physician Assistant program will allow me to accomplish this. Working in a rapid response laboratory has been satisfying, knowing I provide information that could help a provider with a diagnosis. The real challenge I face in the laboratory is being closed off from the patient world. I miss the direct involvement of a patient, placing a name to a face, and the impact that you can make on a patient or even more empowering; the impact the patients makes on you. A career as a physician assistant is where I will accomplish the pieces of the puzzle, making the picture look complete. Working in this field will allow me to work as a team with medical professionals while working directly under the supervision of a physician. A key factor for me pursuing PA is the variability to change specialties. I will go into the program with an open-mind, and willingness to learn many different specialties. This is where I will find my true passion within medicine and even better I am not limited to one area of specialty. Other careers, such as a medical doctor or nurse practitioner do not have the option of changing specialties so easily. My education has led me exactly to the path I want to pursue; my determination is what will get me there. I have a passion for medicine and just like sailing when I was a child, I still enjoy the challenge, working as a team, and succeeding in my goals. A career as a PA, will give me the capability to raise the sails once more and let the wind guide me. This route allows constant wind that keeps the sails full and the boat in forward motion. It is with this motion I find peace!